It’s President’s Day, and it’s also tax season, when the majority of the nation’s working class citizens look forward to receiving their annual income tax checks. What do President’s Day and free money have in common? Not a lot, unless you happen to be a member of the Nevada online poker room, Real Gaming. To commemorate the holiday, there’s a special promotion going on today only at Real Gaming. It’s called the President’s Day $150 GTD Shootout. The tournament is free to enter, and it starts this evening at 6:00pm sharp. All confirmed members of Real Gaming who are physically located in the state of Nevada when the tournament begins are eligible to participate by registering in the tournament lobby before 6:00pm. There’s no charge to play, and a total of $150 will be paid out to the top finishers. 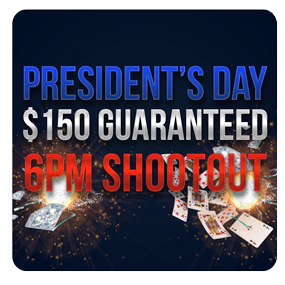 There’s an added incentive to play in cash games during the President’s Day $150 GTD Shootout Freeroll. Every day at Real Gaming, the operator pays out cash prizes to the High Hand of the Hour. Players can win anywhere from $2 to $30 in cash for achieving the highest Loyalty Score (poker points) in any given hour, but you have to be at a qualifying table, and earn a minimum Loyalty Score to qualify. Qualifications are based on the stakes being played, with higher cash rewards paid to higher stakes tables. For example, earning a Loyalty Score of 20+ while playing Remo Table at stakes of $2/$4 between 6:00pm and 7:00pm, and having the Highest Score of the Hour, will award $30. In contrast, earning a Loyalty Score of 2+ while playing a Thunder Table at stakes of $0.01/$0.02 between the hours of 8:00pm and 9:00pm, and having the Highest Score of the Hour, will award $2. Note, however, that all prizes are split between qualifying tables. That means that if two players at two different $2/$4 Remo Tables achieve a Loyalty Score of 20+, and have the highest score of their individual table, they will each receive a $15 cash prize. You can get more info on Real Gaming’s High Score of the Hour promo here. The chances of that happening aren’t too high, though. According to PokerScout, Real Gaming is still averaging just 2 players at the cash tables at any given time over the last 7 days, with only 7 players at peak hours. As such, there aren’t usually more than two or three ring games active at most. Real Gaming has been amping up its promotional offerings ever since the site received the go-ahead from Nevada regulators to transcend the beta testing phase and initiate a hard launch of the online poker site back in October of 2014. But despite a multitude of marketing campaigns that seem highly beneficial to Nevada’s online poker player, South Point’s Real Gaming has yet to draw in any significant traffic. Competing with WSOP.com—the only other online poker operator in the Silver State since Ultimate Poker dropped out in November—hasn’t been easy. WSOP.com currently controls 98.6% of the Nevada online poker market, averaging 140 players over the last 7 days to Real Gaming’s 2.